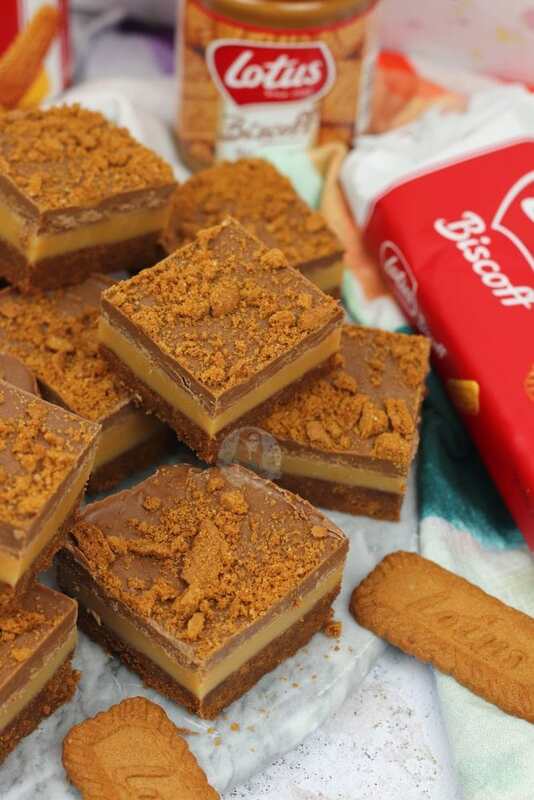 Biscoff Biscuit base, Homemade Caramel Filling, and a Biscoff Chocolate Topping… Biscoff Millionaires Traybake! 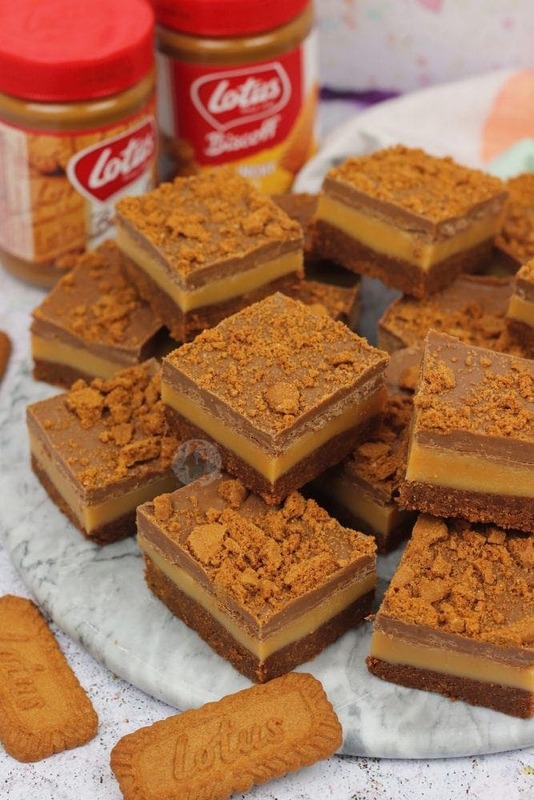 Oh hey there, a new Biscoff related recipe that I know you are all going to adore and LOVE! Why would you not love it?! 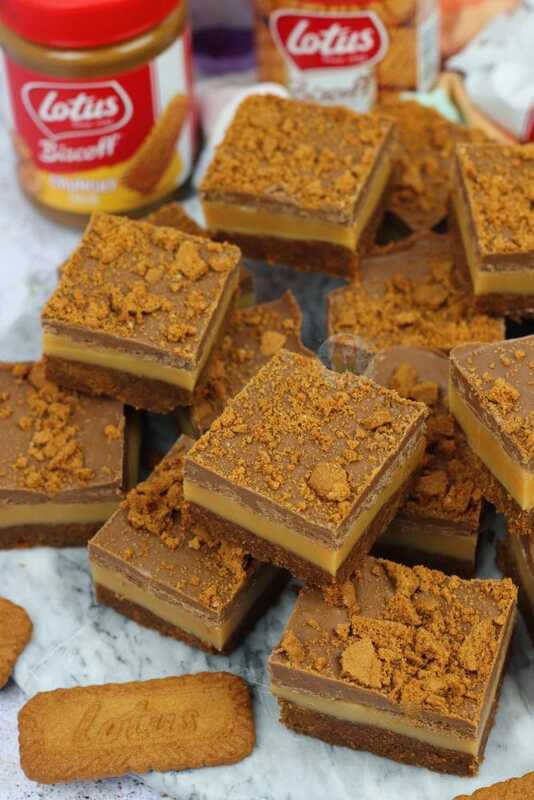 Biscoff Biscuits, Caramel, and Biscoff spread all in one delicious combination of heavenly bites. 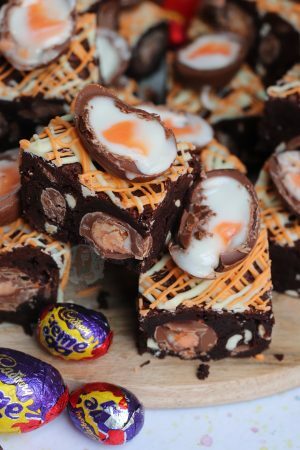 Is it too far to say I would happily eat the entire traybake?! 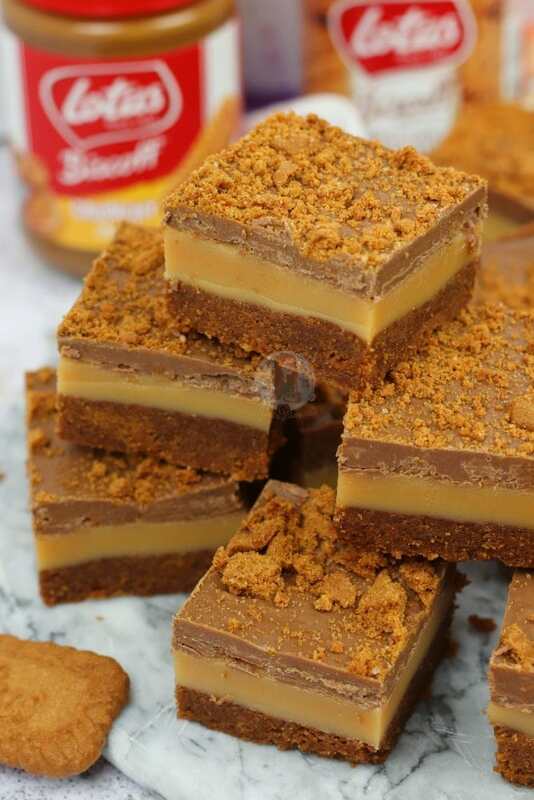 So, who can honestly say no to a new Millionaires Shortbread style recipe? Certainly not me. I will say from the off, so as to stop any pedantic people… no, it’s not actually shortbread, but its a type of traybake. 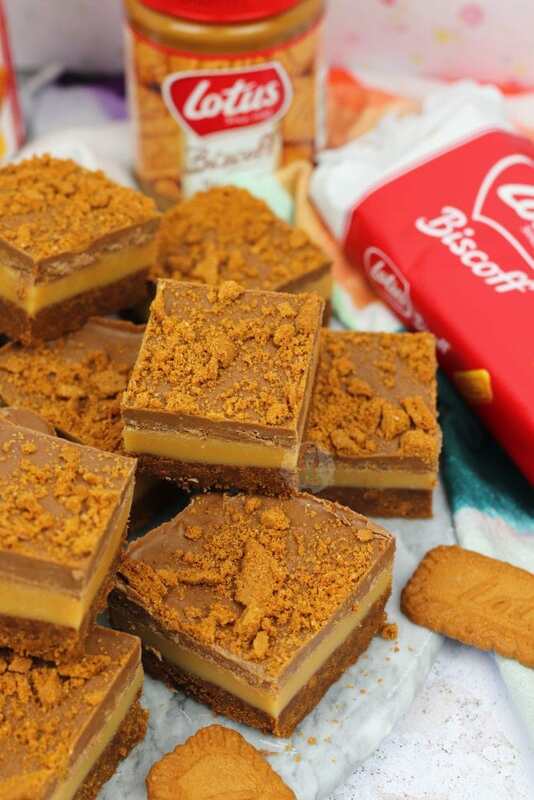 If you say Millionaires Shortbread, people get the idea, and when you add Biscoff on top of that, people automatically go ‘oooooh…’. This particular beauty is heavily inspired by my Malteser Millionaires Shortbread, and oh my actual days. It is essentially the exact same thing, but swap all Malteser related goodies out for Biscoff. Yeah, maybe you don’t need to read an entirely new post on it, and I maybe don’t need to write it, but seeing as I can’t find anything similar on google yet…! 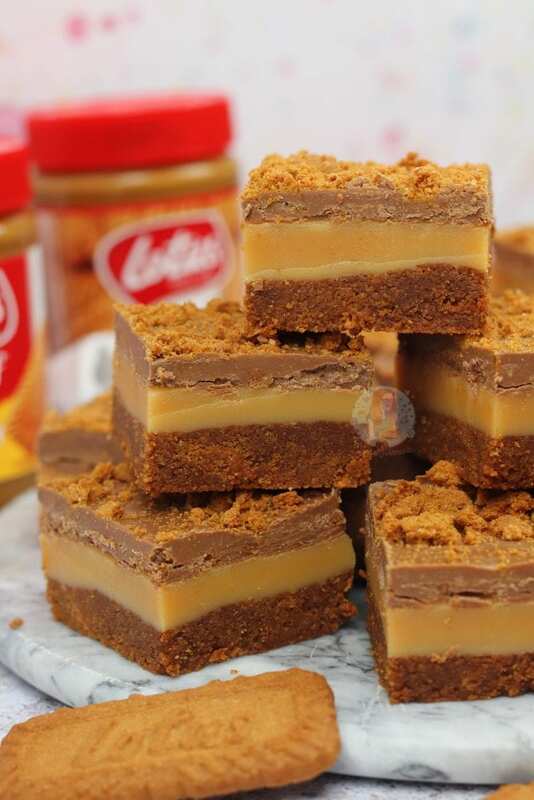 Just like my Malteser Millionaires Shortbread, many ‘big social media pages’ will probably take a carbon copy of this, call it their own, and you’ll forget this recipe even exists, but I can try. 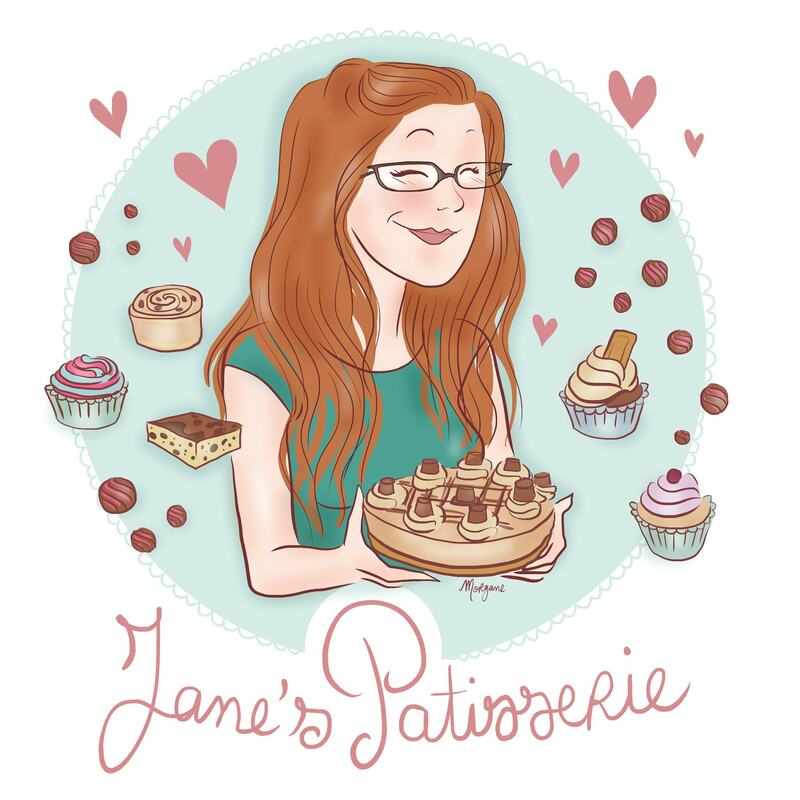 This might sound like an incredibly random thing to say, but after my Malteser Millionaires Shortbread, there were many extremely similar posts created, so hey ho, here’s the original. 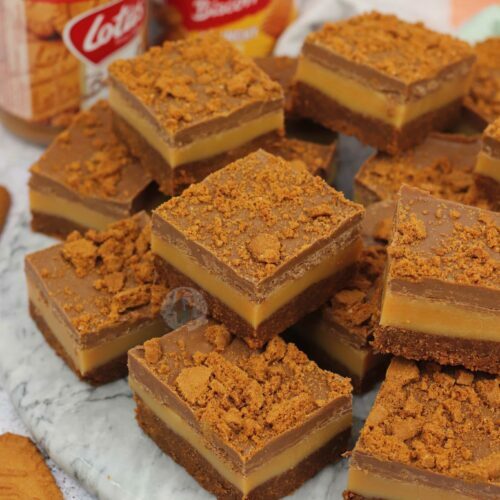 My Biscoff Cheesecake and my Biscoff Cake recipe have always been super amazingly popular on my website, thanks to Zoella making them a while ago! Some people have still yet to ever try the wonders of Biscoff, and you are 100% missing out if you haven’t tried it yet yourself. My Salted Caramel Millionaires Shortbread has been a classic from the start, and I love to try new things. 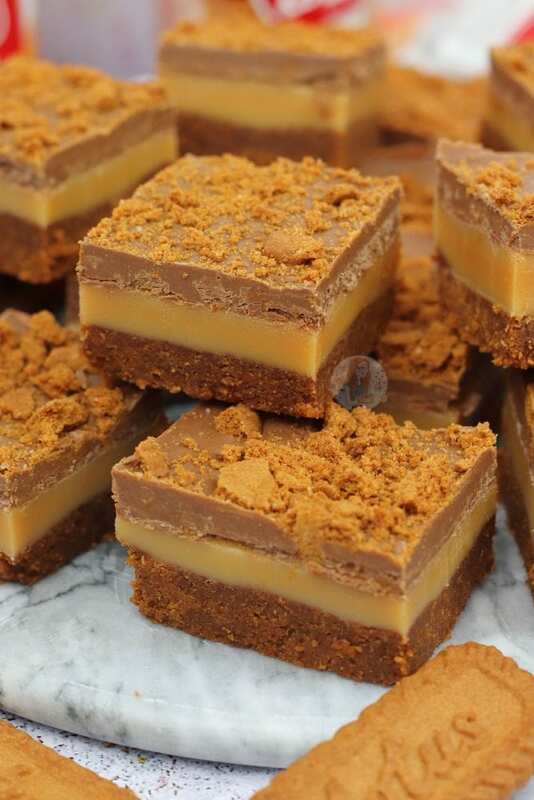 Millionaires traybakes are basically biscuit, caramel, and chocolate. 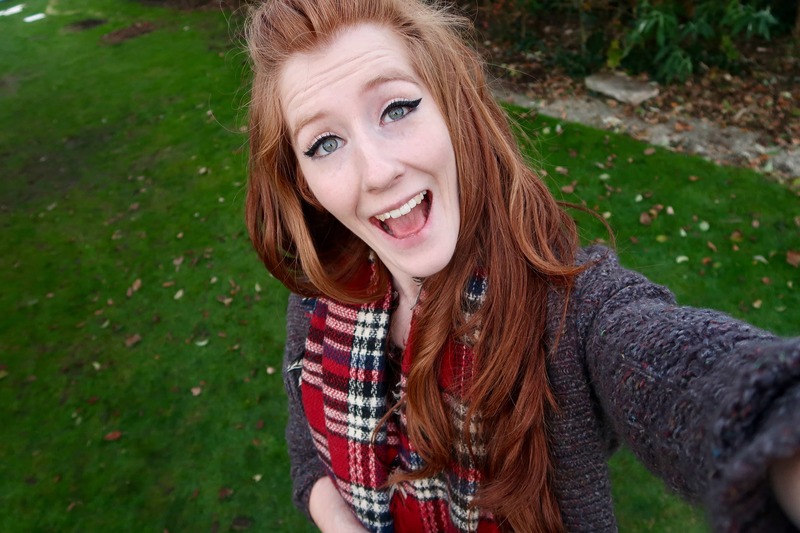 As you can see from my various Millionaires related posts, I am a big fan of it and experimenting with the idea. How can you not like the combination of biscuit, caramel and chocolate?! There is quiiiite a lot of biscuit in this recipe, but its an optional thing. The reason I use 500g of biscuits in this recipe is that a 9″ square is equivalent to a 10″ round recipe, and that’s pretty darn big. You can use less if you wish, but as you may have noticed from other recipes such as my Biscoff Cheesecake, I love a deep biscuit base. If you wanted to make an 8″ round bake, the same as a 10″ round bake, you would need to multiply a recipe by 1.6x. So, the 300g of biscuits in a Cheesecake, would become 500g. There are notes below on if you want to make it thinner, however! Also, you MUST NOT USE tinned Caramel for the filling. It’s not the same, and it doesn’t work. Have faith in the recipe, its 100% worth the effort. As I have made millionaires type caramel oh so many times now, I’ve had the practice of exactly when I need to take it off, what temp to use, etc. It’s a little bit of trial and error for your first times, but try it anyway! It’s worth it! Enjoy! Biscoff Biscuit Base, Homemade Caramel Filling, and a Biscoff Chocolate topping... Biscoff Millionaires 'Shortbread'! Tip the biscuits into a lined 9x9" Square Tin and press down firmly. Pour the caramel onto the Biscuit Base and leave to set for one-two hours on the side. If it's hot, set in the fridge! Melt your Milk Chocolate down carefully in the microwave, or in a bain-marie. Also, in a separate bowl, melt the biscoff spread for about 30-40 seconds so that it's softer and not as hard. Mix the two together, and spread on top of the caramel. Sprinkle over some biscoff crumbs and then set on the side or in the fridge. Biscoff spread is found in most supermarkets - you can use smooth or crunchy! 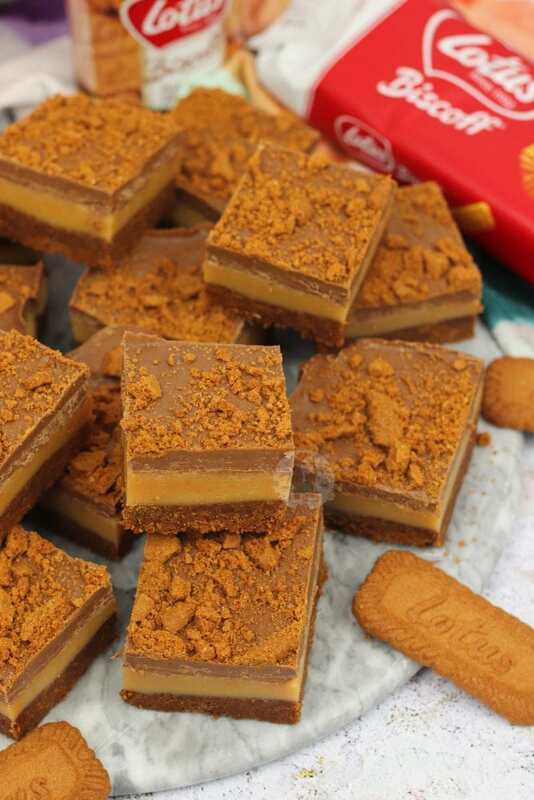 If you don't want to use the spread, you can use 300g of chocolate on the top, and plenty more biscuits! You can use fewer biscuits if you don't want it as thick. Use 400g, with 135g of butter. Older Next post: Milkybar Cheesecake! 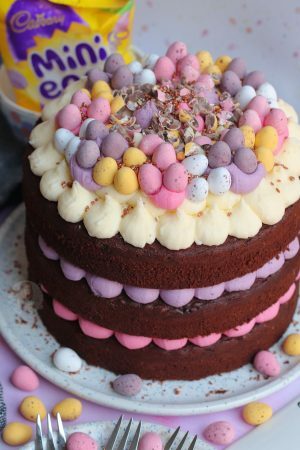 Newer Previous post: Christmas Chocolate Cake! Haven’t tried your recipe (yet!) but tried Lotus biscuits in lieu of Digestives myself last year and it’s ten times nicer! Look forward to trying yours out. Hi Jane. I just made these and they’re incredible! 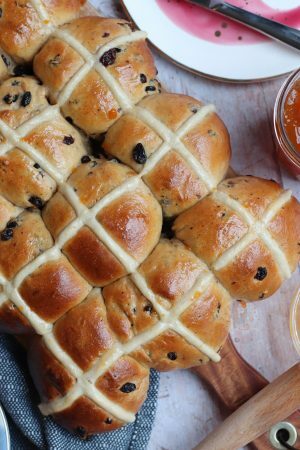 So simple to make and delicious to eat. Hey, this recipe looks great! However, I only have a 7×10 tin, do you know how I would adjust this to fit my tin? Looks amazing. Big fan of Millionaires and Biscoff. Thanks! Hi Jane! 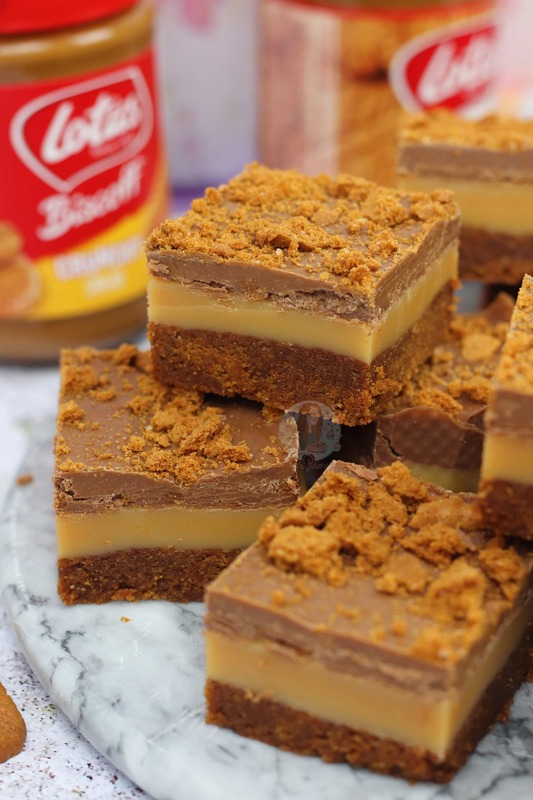 I just tried making your Millionaire’s Biscoff Traybake – and I’m not sure yet how it’s going to be! I had a few bumps in the road, but I think it may be okay. When I was making the caramel sauce, I think it might have heated too long, as there was liquid (a lot) that just wouldn’t mix in with the rest of the ingredients. That’s okay though – there was still fudgy caramel as the layer on top of the biscuit bottom. Also, by mistake I left the milk chocolate chips in the microwave too long – so they burned! I had semi sweet in the house – which probably would not be the first choice but I used it. It’s in the refrigerator now so we shall see! Looks delicious though! !